SOAs offer a key technology for amplification, switching, wavelength conversion, and regeneration in optical networks. As bandwidth demand rises, the construction of optical packet-switching nodes targeting optical routers would benefit from fast optical switches. Semiconductor-optical-amplifier (SOA) technology provides this high-speed switching capability as well as gain, high extinction ratio, and high integration potential. Moreover, it is a key technology for several other functions, including all-optical wavelength conversion, regeneration, wavelength selection, booster and in-line amplification, in-node optical preamplification, and mid-span spectral inversion. An SOA is based on the same technology as a Fabry-Perot diode laser. Such a laser consists of an amplifying medium located inside a resonant (Fabry-Perot type) cavity. The amplification function is achieved by externally pumping the energy levels of the material. In order to get only the amplification function, it is necessary to protect the device against self-oscillations generating the laser effect. This is accomplished by blocking cavity reflections using both an antireflection (AR) coating and the technique of angle cleaving the chip facets. Unlike erbium-doped fiber amplifiers (EDFAs), which are optically pumped, SOAs are electrically pumped by injected current. The basic SOA consists of a central active section about 600 µm long and two passive sections at the input and output sides of the chip, each around 100 µm long. The central active layer is based on a separate confinement heterostructure (SCH) and consists of a 0.2-µm-thick tensile bulk active layer embedded between two 0.1-µm-thick quaternary layers. 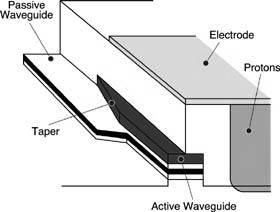 It is tapered over a length of 150 µm, which allows optical coupling to an underlying passive waveguide. This type of structure provides a high optical confinement factor because of index mismatch between the layers in the gain section, together with a large spot size at the facets for achieving a high chip-to-fiber coupling efficiency. · chip-to-fiber coupling loss of less than 3 dB per facet, which is achieved using integrated mode-expanding tapered waveguides at the output facets. · polarization sensitivity of less than 0.5 dB, because the polarization state of the optical signal coming from a link fiber is usually random. Material gain is isotropic in bulk material, however, so polarization sensitivity (differential gain between transverse-electric (TE) and transverse-magnetic (TM) modes) as low as 0.3 dB can be achieved with a near square (0.4 µm * 0.6 µm) active waveguide having almost the same confinement factor for both polarization states. All these characteristics cannot be simultaneously obtained, so compromises must be found. A quantum-well (QW) SOA structure will satisfy requirements for low residual reflectivity and optical loss, as well as high material gain. On the other hand, such a structure is inherently polarization sensitive, as TE mode gain is greater than TM mode gain. The effect can be reduced by combining compressively strained QWs, which yield higher TE gain and tensile QWs, which yield higher TM gain. Depending on the efficiency of the AR coating, SOAs can be classified as resonant devices or traveling-wave (TW) devices. Resonant SOAs are manufactured using an AR coating with a reflectivity around 10-2. They typically feature a gain ripple of 10 to 20 dB and a bandwidth of 2 to 10 GHz. TW devices incorporate a coating with a reflectivity less than 10-4 . They show a gain ripple of a few dB and a bandwidth better than 5 THz (e.g., 40 nm in the 1550 nm window). Telecom applications require a TW design, which can be used for applications such as single-channel or wavelength-division-multiplexed (WDM) amplification in the metro space, optical switching in core network nodes, wavelength conversion in optical cross-connects, and optical reshaping and reamplification (2R) regenerators or optical reshaping, reamplification, and retiming (3R) regenerators for long-haul transport networks. The input optical power Pin injected into the SOA waveguide is amplified according to Pout = Gsp Pin, where Gsp is the single pass gain over the length L of the TW SOA such that Gsp = exp (gnet L). The net gain gnet is given by gnet = g — where , g, and are the optical confinement factor, the material gain, and the optical loss, respectively. Using titanium oxide/silicon oxide (TiO2/SiO2) layers for the AR coating technology, it is possible to achieve reflectivities on the order of 10-5. By combining tilted facets (about a 7° angle) with an AR coating, a device with a highly reproducible and extremely low residual reflectivity can be achieved, leading to gain ripples as low as 0.5 dB. A large number of incoming channels can saturate an SOA. Gain saturation caused by one channel modifies the response of the other channels, inducing crosstalk between channels. WDM applications thus require a device with high output saturation power. To solve this problem, researchers at Alcatel have developed the gain-clamped (GC) SOA, which is based on distributed Bragg reflector (DBR) technology. In a GC-SOA, the design is modified to incorporate a Bragg grating in each of the two passive waveguides. This creates a resonant cavity and thus a lasing effect. By programming the SOA to generate the lasing effect at a wavelength laser located outside of the desired amplification bandwidth of the SOA, it is possible to stabilize the gain. Amplifiers: Discrete stand-alone SOAs can be used as compact booster amplifiers (a standard device for single-channel operation, a gain-clamped version for WDM operation), or to achieve high-sensitivity optically preamplified receivers as an interesting alternative solution to replace avalanche photodiodes for data rates of 40 Gb/s or higher. Noise figure is a key consideration for amplification applications. Noise figure is defined as nsp/C1 where nsp is the inversion factor and C1 is the overall input loss (mainly input coupling loss of about 3 dB). Because nsp and C1 depend on the polarization state of the input light, noise figure is defined for each polarization state. Usually, for nonpolarization-dependent amplifiers such as EDFA, noise figure is defined as 2nsp/C1. Thus, a 3 dB difference exists between SOAs and EDFAs. Switching: Optical cross-connects (OXCs) constitute a major application area for SOAs. High-capacity optical routers in WDM nodes must perform high-speed optical packet switching as well as all-optical wavelength conversion to avoid channel conflict and to provide wavelength reallocation. SOA gate arrays are well suited for fast switching of the WDM 1550-nm wavelength range. An SOA gate array is an array of devices monolithically integrated on the same substrate and used as a gate. When injected current in an SOA is high, it passes light through with some amplification. When injected current falls near zero, the device blocks the light. Thus, an SOA array can act as a switch. A number of SOA chips can be integrated on the same substrate to create high-density switching matrices. Hybridization on silicon or silica platforms can enable large-scale integration. This technology provides self-alignment of the SOA array to input and output fiber bundles using V-grooves and alignment indentations performed in a silicon submount. Wavelength conversion and regeneration: Reconfigurable networks require wavelength conversion capabilities and all-optical regeneration. Wavelength conversion can be achieved through cross-phase modulation (XPM) performed in an SOA-based Mach-Zehnder interferometer. An input modulated signal at the wavelength s modulates the carrier density of the SOA inside the interferometer due to cross-gain modulation (XGM). This effect modulates the refractive index of the material and thus modulates the phase of an incoming continuous-wave signal at the wavelength c. The Mach-Zehnder interferometer converts this phase modulation into amplitude modulation. At 10 Gb/s, all-active Mach-Zehnder wavelength converters show input signal sensitivities as good as —10 dBm with a conversion penalty of less than 1 dB. The method can perform up or down conversion for any wavelength within the C-band. A key advantage of the Mach-Zehnder structure is that the nonlinear response of the interferometer results in an increase in signal extinction ratio after conversion, leading to 2R regeneration. A wavelength conversion operation incorporating a cascade of two SOA- based MZ-interferometer wavelength converters used in a co-propagation scheme can yield 3R regeneration. The first stage performs reshaping and retiming; then the second stage matches the chirp of the output data for transmission over a high dispersion link. In a differential-mode configuration, this approach can operate at data rates as high as 40 Gb/s. Selection and inversion: SOA-based devices also can perform wavelength selection and midspan spectral inversion. A wavelength selector has been created using SOA gates positioned between two phased array wavelength demultiplexers. This scheme can achieve nanosecond-scale wavelength selection. The monolithic integration is very attractive in terms of compactness and compatibility with high-volume manufacturing. Spectral inversion is a mirror effect achieved in the signal spectrum between higher frequencies and lower frequencies, which are inverted. It can be used as a dispersion compensation technique. It can be implemented using optical phase conjugation (OPC) in an SOA structure in high-bit-rate transmission systems using standard single-mode fibers. Such an approach can allow a system to operate even in the face of high chromatic dispersion. The OPC is realized by generating four-wave mixing (FWM) in a long bulk type SOA structure (around 1200 µm long) optimized to show a high confinement factor ( ~0.6). The SOA, located at the midspan of the link, exhibits a high FWM conversion efficiency and optically conjugates the signal spectrum. The signal spectrum is inverted at the SOA output and the signal is regenerated after propagation in the second half of the link. Long-haul high-bit-rate transmission can be achieved using OPC in an SOA. SOAs are an enabling technology for advanced optical networks. The potential for large-scale integration of SOA technology offers economical, high-performance devices that combine monolithic and hybrid solutions. Monolithic integration on indium phosphide can be used to create MZ-SOA wavelength converters or integrated wavelength selectors. SOA-arrays hybridized on silicon or silicon dioxide submounts can be made using the combination of both hybrid and monolithic technologies. Using SOAs, various devices can be built with enhanced functionalities as required for future optical networks.